The Telangana State Government has introduced a prestigious project which was named as “Webland” throughout the state in 2019. The main objective of this project is to determine and clarify the boundaries between the agricultural lands in Villages. All Land records are made online and computerized through this Webland Online Portal. This Was under the control of the Revenue Department of Telangana Government, under the Maa Bhoomi Initiative. All the Telangana Land records which are already seeded with the Aadhaar numbers can be digitally mapped on the Google Maps. Any Person owning land can map his area in Google Maps. If any problem arises in the area of the land it can be properly fixed with the given survey numbers in 2019. Each and every fine detail about the Webland Telangana is defined in this article from its roots to its extent – Learn more about Bhunaksha Telangana & Complete Details. The testing of the Webland Project was first started in the Mulkalakalva village in the Mirayalguda Division. Under this Project, they started updating and purifying the Land records in the respective Area. Digitising, Updating and Purifying the Land Records. Issuing and Replacing the e-pattadar passbooks. Providing all the Paahani Documents to the Land Owners. The above-mentioned village has been like a Pilot SIte for the testing of the Webland. Through this pilot testing, they check the feasibility as well as the areas for improvement of the elaborate process of the Land Records verification. Also, the following are the list of the services which are provided through the Webland Online Portal. The Procedure of logging in is mentioned in below sections of the article. During the testing period, the Revenue Division Officer (RDO) has given an extensive training to all other Revenue Officers, Giridavars, Tahsildars, and Computer Operators in the Village. The RDO also showed a template of the revenue profile and discussed how to fill it up properly. The below are the advantages of introducing the Webland Project into the State’s Revenue Department. These are considered as the major advantages of all the Other services. Helping the Farmers to demarcate their land which is large and quite close to others. Avoids the problems in distributing the land across the Telangana State to the owners. All of these Webland Project’s services are helping farmers a lot by helping them out in knowing their Land areas and borders so that others won’t use or possess their Land. With this new technology, even a common man or even a farmer can define the borders of their lands. Latest and Updated data of the Land Records can be found in the Webland Portal. Avoiding the usurp of lands between the owner of the lands. The Webland project demarcates the borders of the Land based on the Ownership. So many banks in Telangana State are utilising all these digitised records for verification before sanctioning lands to the Applicants or farmers. All these records are always updated online can be a huge asset for all the farmers in the State. Verifying and Updating all the Pahani Documents and the e-pattadar passbooks can also be a lot helpful for the farmers and these Document Holders. How to Login to Webland? Once you logged in to the Webland Online Portal, you can be able to access so many services. Just follow the Step-by-step guide for the Login Procedure carefully, to get access to all the Services. Visit the Official site of the Webland Online Portal. Click here https://webland.telangana.gov.in/ to visit the Page mentioned. Login to the Webland portal on the Homepage itself. 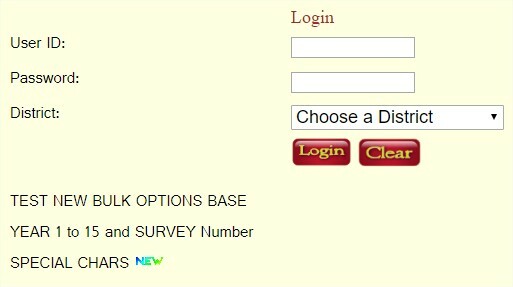 The Login Section will be as shown in the image below. You have to enter the Login Credentials such as User ID, Password, District etc and Click on the “Login” option under the Section. For the District option, you have to choose your District from the Dropdown list of Districts. While entering the details in their respective columns, you may make mistakes. Then you can use the option “Clear” which will be resided beside the “Login” option which was mentioned above. As we know that, Land Distribution Reports and Checklists can be provided through this Webland Portal. Follow the below steps to download the Land Distribution report via Telangana State’s Webland portal. Visit the official website with the Above-mentioned link. Click on the “Land Distribution Report (Public View)” on the homepage itself. You will be redirected to a page where you have to fill in some details. Some details like District, Mandal, Village, Phase and Survey Number from their respective Drop Down lists. After selecting all those details you can click on “Generate” to view your report or you can also click on “Print” to directly print out the report. But before proceeding with the Printing or the Generating procedures, your details will be verified and then generate the result on your Screen. You can also seed your Aadhaar number through the web-based Android Application which was developed for the Webland Services. The following are steps for you to know How to Install, Launch and How to seed Aadhaar. Go to the Webland Portal homepage. Click on the link “Download UID Seeding Android Application” on the homepage. The application file will automatically start. After downloading the Application, Install it on your phone or any type of handset. After installing the application, launch the Application by opening the “UIDSEED Live” icon. Log in to the Application with the same Login Credentials you used to login to your Webland Portal. Click on “Seed Aadhaar” on the main page of the Android Application. Verify your Name on the Aadhaar card in the Webland. Enter the Valid Aadhaar number in its respective column. Enter the mobile number linked to Pattadar if available. If you don’t have any mobile number linked to Pattadar then just check out the box named as “No Mobile Number”. Click “Save” option after entering all the details. If all the entered details are correct and verified then you will receive a message showing as “Aadhaar Seeding Successfully Finished”.